My current job installing rural wireless networks and training IT companies in developing regions with Inveneo has already taken me to some fascinating places. This image, currently featured on the front page of the Inveneo website, was taken in a UNHCR refugee camp for displaced Congolese living in Rwanda. 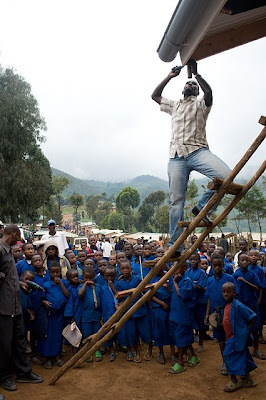 The picture shows an engineer from Inveneo's Rwandan partner, RockGlobal, installing a long distance wi-fi antenna that will link the camp's classroom to the internet.